I love starting my mornings with smoothies (and coffee, lots of coffee) but some days I just don’t have 10-15 minutes to chop, peel, pour and blend greens, fruits, powders and other nutrients into healthy concoctions. To save myself the time and trouble, I portion out the ingredients for five days worth of smoothies into plastic sandwich bags. This example includes one large papaya, five small bananas, a handful of fresh spinach in each bag and generous portions of frozen mixed berries. Seal bag completely and store in the freezer. In the morning, I add collagen powder to help my skin and joints, bee pollen for protein and allergy prevention, and chia seeds packed with fiber and omega-3 fatty acids. Lastly, I top the mixture with milk, water or coconut water before blending. I rinse the plastic bags, turning them inside out to dry fully before reusing the next week. If you love quesadillas but are looking for a healthy twist on the classic recipe, try my sweet potato and black bean version. My vegan recipe forgoes shredded cheese — haters will say it can’t be a quesadilla without queso — but can be added, of course. I’m also including the recipe for my cilantro sauce that pairs perfectly with this quesadilla; feel free to add more garlic or leave it out completely, depending on your personal preference. This quick, filling meal is perfect for a weeknight — especially Meatless Monday. Start by blending the ingredients for the sauce and refrigerate. Warm a large, nonstick pan on the stove and do not add oil or butter, this way the tortilla gets crispy, not soggy. Place one tortilla on the pan and spread half the mashed sweet potatoes, beans and lime juice across half of the tortilla and fold the empty side over the mixture. While the first side cooks, add corn and tomatoes to the pan. Flip the quesadilla and allow the vegetables to cook until the second side is fully cooked (tortilla should be brown but not burned). Plate the quesadilla, drizzle cilantro sauce over it and add half a sliced avocado as well as the cooked vegetables to the dish. Repeat quesadilla steps for the next serving. 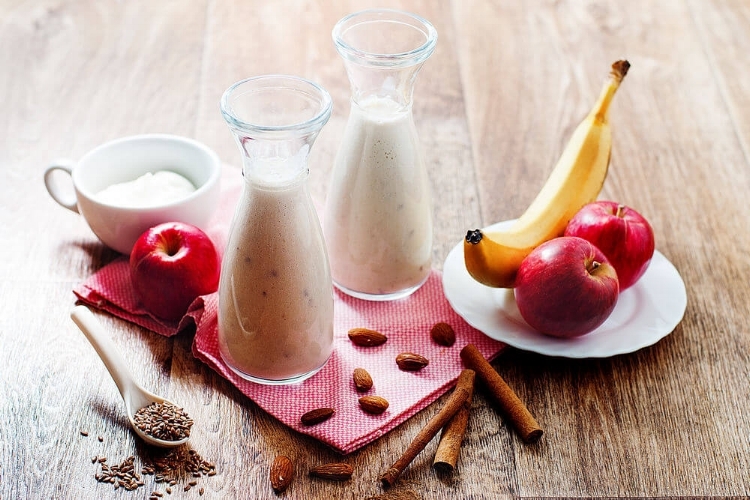 This delicious smoothie is a quick and nutritious way to kickoff your morning. Packed with vitamins and nutrients that hydrate your skin, slow the aging process and reverse cell damage, this breakfast drink helps you look your best from the inside out. I typically make only one serving for myself in the morning, but you can easily multiply the recipe if you've got additional early risers in your household. Add ice for additional hydration and a smooth frozen texture, blend and pour! So easy. I was born in late spring so summer was the first season I really experienced and I am pretty sure that is why I love it the most. But even after the season’s juicy melons and tangy citrus are past their prime, Mother Earth’s bounty offers up some of its richest flavors and a cornucopia of benefits for our bodies. Before hitting the grocery store, check out my list of favorites to fill your cart this fall. Sweet Potatoes: The long-lasting, versatile veggie is packed with Vitamin C and E which improve the immune and cardiovascular systems, exactly what we need as cold season looms in the near future. The tuber also offers Vitamin B, maintaining your mood, and Vitamin D, the “sunshine vitamin” of which we need to increase intake levels during colder months. Rutabaga: This thick-skinned root vegetable is a great source of potassium for regulating blood pressure and serves up lots of fiber, aiding in digestion. Also known as Swedes, they have phytochemicals that eliminate the body’s carcinogens and help the liver process harmful toxins. What’s more, a serving of rutabaga includes over half the daily value of Vitamin C.
Pumpkins: Reigning king of the season, pumpkins have a wealth of nutritional benefits — when they’re not flavoring your latte, sorry ladies. Expectant mothers can benefits from their folate levels which boost cell renewal and fetal development. Don’t toss the seeds! Instead, roast them with a little oil and salt, as they contain tryptophan, an effective treatment for social anxiety disorder that improves your mental well-being. Carrots: This fan favorite is the most abundant food source of beta-carotene, effectively slowing down the aging process by diminishing wrinkles and repairing cell damage. The Vitamin A in carrots protects the skin from sun damage, acne, uneven tone and dryness. Those of us who consume carrots at least twice a week have drastically lower rates of glaucoma. Red Cabbage: Although you can find cabbage in grocery stores any time of the year, the cruciferous vegetable ripens at the end of the summer and gets sweeter as the weather turns colder. Red cabbage contains ten times the vitamins of its green brother, improving your eyes, teeth and bones. I put this recipe together for the first time this summer and it was a huge hit with my Latin husband and not too spicy for this Gringa. Combining healthy, lean protein with the best seasonal fruits and vegetables, this meal can be made ahead of time for easy midweek dinners. I recommend making extra salsa (especially if you have a chopper to do all the dicing for you), and eat with tortilla chips or over spinach for a quick salad. Add chicken to crock pot and cover with the Mojo Criollo marinade. Cover, turn to high and cook for 2.5 hours (alternatively, cook on low for about 5 hours). While the chicken cooks, chop tomato, onion and cilantro. 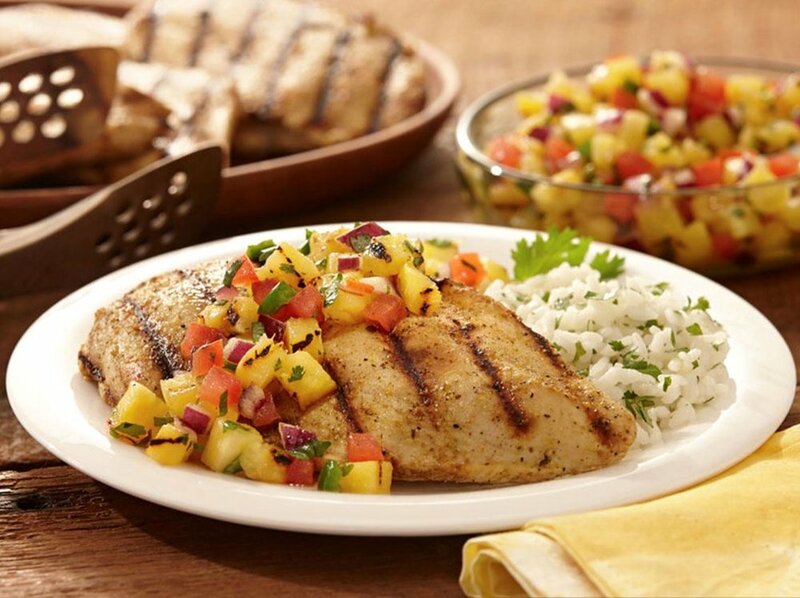 Heat coconut oil on a skillet and add pineapple chunks, allowing them to brown (about 4 minutes each side). Remove the browned pineapple from the heat and chop. Add all the chopped fruits and veggies to a large bowl, add corn and mix well. When chicken is fully cooked, remove from the crock pot and shred with a large fork. Pop Ready Rice in the microwave for 90 seconds. Plate rice and chicken, top with the salsa and add half an avocado to each plate. After almost every meal, no matter how satisfying, I am overcome with an irresistible craving for something sweet. If you're trying to cut calories or lower your sugar intake, there are plenty of guilt-free ways to please your palate. To combat your sugar cravings without reeking havoc on your diet, try one of these naturally sweet alternatives for your next dessert. Raspberry Frozen Yogurt: Blend Greek yogurt, frozen raspberries, lemon juice and honey for a homemade blend that is sweet, delicious and takes about five minutes to make. Pears and Peanut Butter: This naturally sweet fruit pairs well with peanut butter for dieters who have grown tired of apples. The fructose will give you a quick burst of energy and peanut butter provides protein to keep you full longer. Blueberries Dipped in Yogurt: A great frozen treat to prepare ahead and enjoy after a day in the sun or at the sweaty gym. Coat fresh blueberries in low fat yogurt (plain or fruit flavored), spread on a cookie sheet covered with wax paper and stick in the freezer. Chocolate Banana Cookies: Stir together instant oatmeal, two ripe bananas and unsweetened cocoa powder, add spoonfuls of the mix on a baking sheet and bake for 10 minutes at 350 degrees. Classic: Avocado mashed up on whole wheat toast with an egg on top. I like to hard boil eggs and have this for lunch throughout the week but if you prefer scrambled or fried eyes, those work well here, too. Optional add-ons include salsa or red pepper flakes. Tex Mex: Trade eggs for black beans and top with lime juice and hot sauce. Veggies: Avocado spread with sliced cucumbers and diced grape tomatoes, sprinkle with dill. Savory Veggie: Heirloom Tomatoes, balsamic vinegrette. I’m allergic to basil but some people think it pairs well with this dish. Philly: Smoked salmon, capers. Optional: red onions and cream cheese. This Friday I am sharing one of my absolute favorite smoothie recipes because it's quick, delicious, nutritious AND wakes you up -- everything a breakfast shake should be (especially on a Friday). If you workout in the morning, this combination gives you potassium, electrolytes, protein and caffeine to start your day with some energy. Add the following ingredients to your blend, mix well and drink up on your way to the gym. In honor of being back in the Big Apple after a month of travel, today I'll share some of the surprising ways this popular produce benefits your body. One of the most highly-consumed fruits in the United States, apples are a delicious, portable and doctor-approved sweet treat. 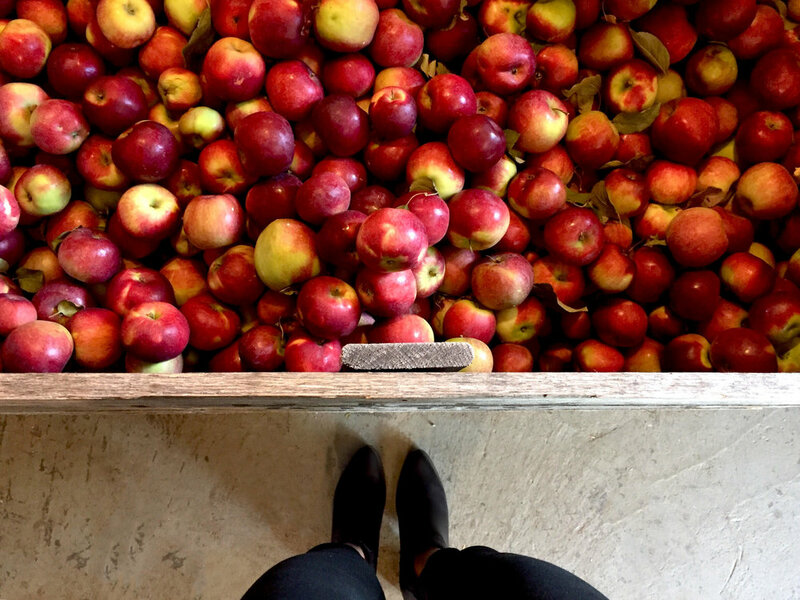 Twenty-five hundred kinds of apples are grown in the U.S. and species triple worldwide. The abrasive texture acts like a mini toothbrush, removing plaque and helping whiten teeth by stimulating saliva production. The natural sugars are more potent than coffee without the inevitable caffeine crash. Apple skins contain a compound that breaks up cholesterol before it solidifies on artery walls, preventing coronary diseases. Studies have proven fruits high in antioxidants -- like apples -- help protect eyes against cataracts. Fighting the effects of aging on the brain, apples can keep Alzheimer's symptoms at bay. Everyone has a weakness when it comes to food and mine is chocolate, specifically ice cream. While sundaes topped with hot fudge are probably not a secret solution to weight loss, dark chocolate is actually very beneficial to your health. If you're looking for ways to treat yourself after a week of "good" eating, read on to see why chocolate could be the indulgence you deserve. One ingredient I incorporate into almost every dinner I cook is avocado. In addition to being delicious, avocados benefit your body in so many ways. The finicky fruit can be frustrating to diners as it can sometimes be hard to tell if they are ripe enough to eat or are past their prime. A simple trick is to check under the stem. If it comes off easily and you can see green in its place, the avocado is ready to eat. 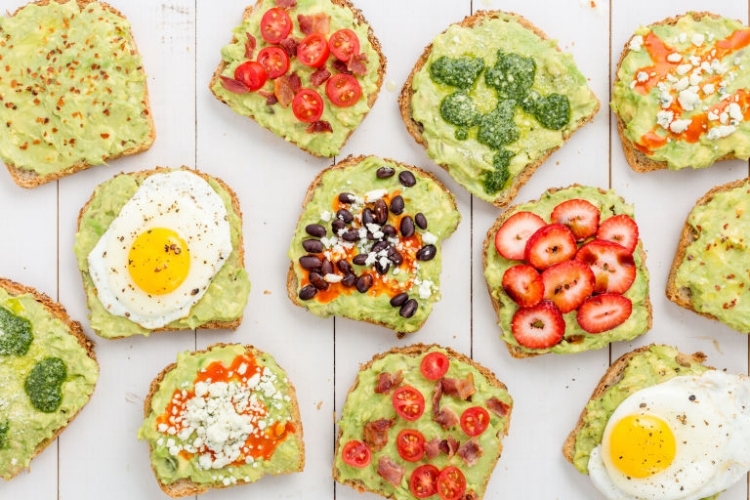 For those of us on the East Coast, avocados are in season now, so I am sharing some of the reasons you should add a few slices to your sandwich, salad or smoothie today. Ok, who wants guacamole now? The vernal equinox came and went but if you live in the Northeast, it might feel as if spring weather will never arrive. Despite the unseasonable chill in the air, we can embrace the season with plates full of fresh fruits and vegetables that are at their tastiest this time of year. 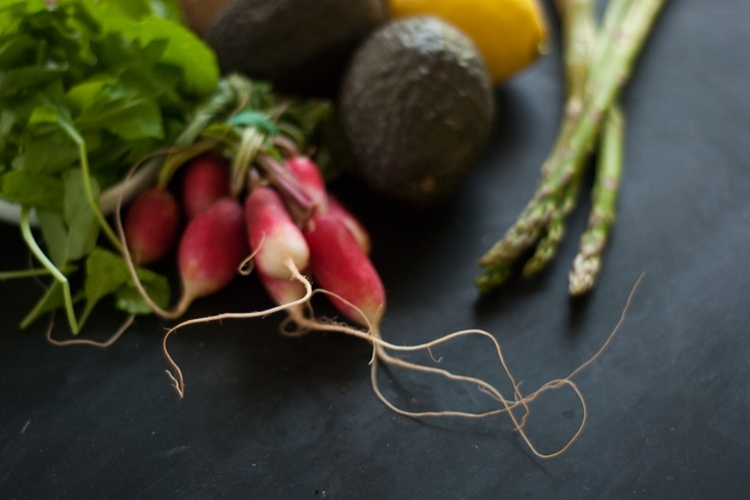 Read on to find out what to stock up on in the produce section. Citrus: Vitamin deficiencies are not uncommon after a long, cold winter and nutrient-rich citrus fruits guard your immune system with more than 100% of your daily Vitamin C needs. Citrus also helps maintain eye health with lots of beta-carotene -- vital to anyone who spent the past few months hibernating in front of the television or computer screen. Banana: Many people ramp up their activity levels in springtime and need additional calcium to prevent injuries. Bananas are a prebiotic that help your body absorb calcium and their high levels of potassium strengthen muscles -- including your heart. Avocado: This fan favorite is in season almost all year in California but here on the East Coast, we can only enjoy the ripest selection for about three months. Rich in L-carnitine, this fruit (yup, they're fruit not veggies) helps metabolize fat cells before bikini season arrives. Artichoke: Harvested in spring and fall, the spring crop is much sweeter and more tender. If you're trying to lose weight, the fiber (about 1/4 of what you need each day) in this vegetable will keep you fuller, longer. Full of peptides and antioxidants, artichokes also help to diminish pimples and wrinkles which also combat the free radicals that damage skin. Asparagus: Available all year, the stalks are thinner, sweeter and more affordable this time of year. This vegetable is said to have been served at the Last Supper and has become a staple for Easter and Passover menus but can be incorporated into your regular diet to help rid your body of excess water and bloat. Kale: Hearty kale leaves can stand up to winter weather and still produce tender leaves that can be cooked or eaten raw. The superfood removes toxins from your body and contains high amounts of antioxidants to fight off inflammatory diseases, such as obesity. Radishes: Suffering from springtime allergies? The anti-congestive qualities of this root vegetable help clear out your respiratory system. Loaded with Vitamin C, radishes also protect your lungs from infection. Boosted Energy: When negative-charged ions -- like those in lemon juice -- enter your digestive tract, your energy levels are naturally elevated without the caffeine crash. Revitalized Complexion: Lemons have antioxidants that attack the free radicals damaging your skin and boosts collagen to smooth fine lines and refresh your skin. Fights Fat: While no food actually burns fat (only your body can do that), lemons help your liver to perform at its best for healthy digestion and also boosts your metabolic rate. Increased Brain Function: Lemons contain potassium which aids in stress relief, clearing your mind and enhancing nerve function to keep you on top of your game. To relieve sore stomachs, improve digestive health and rev up your metabolism ... add ginger. ... If your temperature is soaring, add mint to induce sweating to break the fever. Swap tap for coconut water ... to kick a sugar craving. This recipe can be thrown together in the morning before work and it will be ready to eat when you get home. Bonus: Your house will smell delicious even after you've polished off your dinner plate. Peel and chop two large sweet potatoes, placing them at the bottom of the crock pot. Rub both sides of the chicken breast with olive oil, salt, pepper and rosemary. Add chicken, tomatoes and crushed garlic to the pot and top with broth. Cover and cook on low for approximately eight hours or until the meat is tender enough to pull apart with a fork. Split the spinach between two plates and add half a sliced avocado to eat before layering the cooked chicken and vegetables on top. This is a recipe I put together with the random vegetables in our fridge and pantry but now it's one of our favorite salad recipes. If you love it as much as we do, you can easily double the recipe and eat it again for lunch the next day. Drain water from the tuna cans before adding tuna and mayo to a large bowl and mix with a fork. Once the tuna is shredded and coated in mayo, stir in the chopped carrots, celery, tomatoes and cilantro. Layer two dinner plates with spinach, black beans and corn before topping with the tuna salad mix and sliced avocado. Dress the salad with a little salt, pepper, olive oil and lemon. Serve immediately.